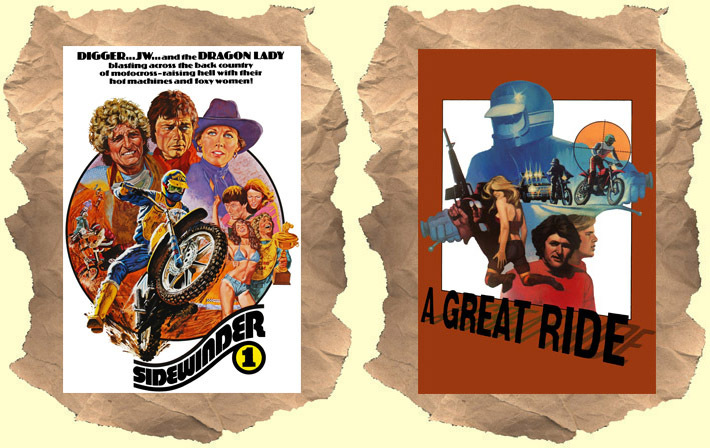 Sidewinder 1: Exploitation centered on the early days of professional dirt bike racing. Michael Parks and Marjoe Gortner are seasoned riders looking for the next level. They struggle along and end up with fast talking sponsor Alex Cord (and eventually the no-nonsense Susan Howard). It's rated PG so not much in the way of violence or T&A. Just lots of riding action, drama and a little sexual tension between Parks and Howard. Overall an entertaining entry for fans of dirt bike / motocross exploitation. 70's musician Eddie Rabbitt provides a few songs on the soundtrack. A Great Ride: Two professional motocross riders head out on a pleasure ride from Mexico to Canada. Along the way they run into various characters like a junkyard woman, two horny hippy chicks and a teen rider and his girlfriend. When one of the bikers makes eyes at the teen's girl he's challenged to a race. That race ends with the teen's head going into a pole. Soon the carefree bikers are on the run from the kid's psycho dad who drives a killer truck with an onboard computer. The leads are likable, there's plenty of nice desert riding and the action scenes are really first rate for a low budget outing (see below). A forgotten sleeper.